This product arrived with each seat in individual packaging. The product is easy to assembly and allows for multiple variations. The chairs and cushions are made with quality materials. Our completed product matches with various colors or dark gray and navy blues. Entertain in style with the Chelsea Collection 8-piece Sectional Sofa Set. 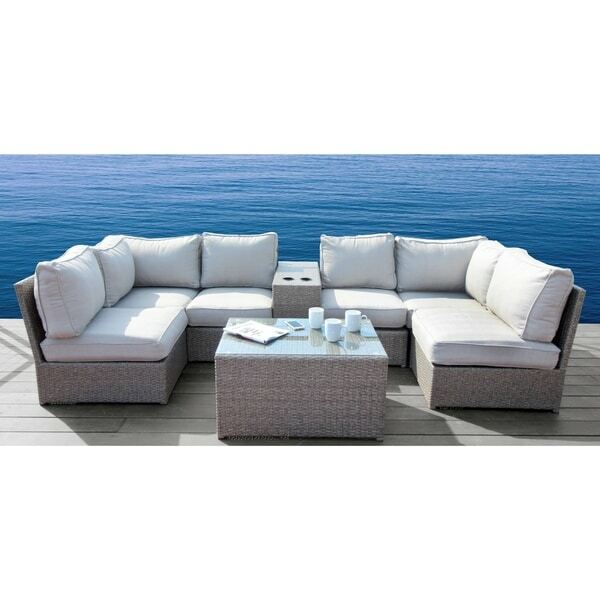 Constructed from aluminum with a woven grey wicker and 5-inch thick ultrasoft seat cushions. The stylish design features a square shape and clean lines to elevate your backyard or patio decor. The coffee table and cup holder table give you plenty of space for your drinks. This was ppurchased for our sunroom. After lookkkng at many options this was chosen because the cushions in the description were the thickest at 5". I wanted the furniture to be comfortable for a nap as well as conversation. I made a great choice! So comfortable. Sure the material isn't as soft as a bedding but it's outdoor furniture and once you're laying down you're not moving and rubbing on it . It's lite weight enough to move into many configurations and I am still not sure the best one for the room as yet! So, I haven't put the clasps on which secure them to not move and cannot comment on the difficulty I have heard about in other reviews. The pieces only. Move slightly when lying down so that hasn't been a major issue. The color is amazing. They have sure come a long way woth wicker! This is a great patio set. True to the description and photo. Looks beautiful on our patio. Great value. This was a great value. It is well made, comfortable, and very attractive. I’ve arranged it several different ways on our screened in porch so it’s versatile for the space and activity. I find the cushions scratchy but think they should hold up well in coastal Delaware conditions. "what is the floor to seat height...including frame and cushion." "what is the floor to seat height...frame and cushion?" "Is the structure under the seats metal? Any way to get a picture of the frame? Is there a weight limit recommended?" "The cushions are removable but are the cushion covers removable for washing?" The cushions are removable and designed with a zipper for easy washing. "Are the sections really "HIGH BACK?" Supportive of the shoulders, neck and head?" The sectional is high back for outdoor standard which provides support to the back and shoulders, but would not support the neck. "Any suggestions in keeping the cushions from shifting? Thank you"
We suggest adding the Cup holder table piece to your sectional. It does a great job of fixing the cushions to the frames. "How many people does this set seat comfortably?" This set can seat 6 people comfortably.